By default the contacts page isn’t very efficient. You have to tap on a contact you want to speak to and then poke around on the details page for the button you want. CallTap is a Cydia tweak that allows you to assign functions like FaceTime and SMS messaging to simple gestures like tapping or holding a finger over a contact’s name. The package for the CallTap tweak creates a directory called ClickToCall in the Cydia extensions section of Settings. Settings include three gestures: Tap, long press, and Detail button. If the gesture for “detail button” is assigned, a button will appear beside the contact name. The assignable tasks for the contacts include Call, Message, E-Mail, FaceTime, and Show detail. If you activate a gesture to call a contact with multiple assigned numbers, a selection dialog will appear with the available choices. CallTap happens to support the iPad, though it is better suited for the iPhone’s Contacts interface. There’s not as much benefit on the iPad’s larger screen, which keeps the contacts list open when browsing for details. CallTap really shines on the iPhone, when switching back from calls and messages to the contacts menu. Before this tweak, I hadn’t bothered with the dedicated Contacts button on my iPhone. 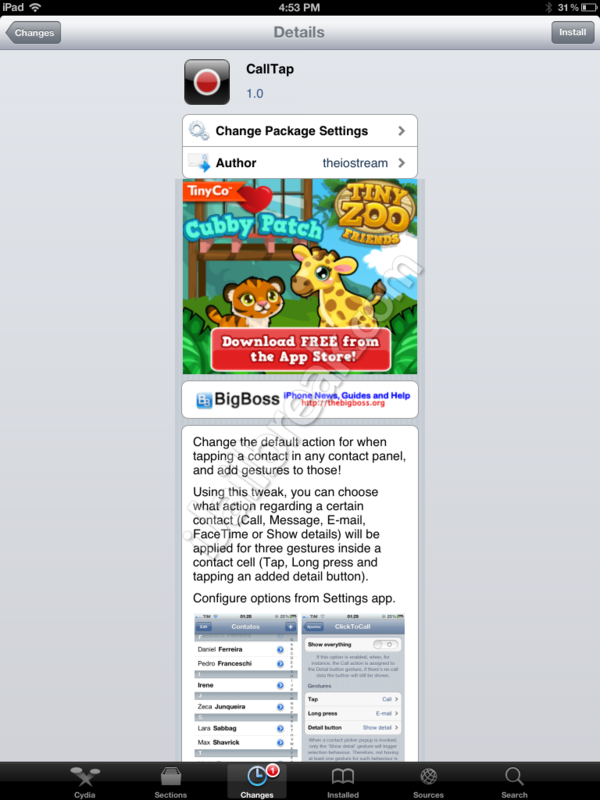 CallTap is a free tweak which can be found in Cydia through the BigBoss repository. Do you find that you use the contacts App, or do you go directly into Phone/FaceTime and Messages? Or did you find a replacement app for the default contact list? Share your thoughts in the comments section below. It’s a nice tweak so far, the pop-ups from you wanting to call/message someone are very quick. Much better than waiting for the UI to animate its way to the contact details and scrolling down if you have more than one item logged down for the contact when all you’re doing 99% of the time is calling or texting them. Only thing I don’t like is that every contact now has that little arrow icon to the right of them if you want to access regular contact details as normal. Turn off the toggle for “show everything”, then set the detail button to undefined.